Hi everyone, it has been a while i didn’t write on Cupid Blogger as i was busy lately with lots of web project. Anyway, i have an announcement to make. 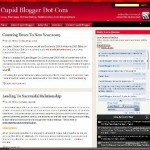 Cupid Blogger has reached the 100th post milestone since it was launched back in 1st December 2008. Besides that, we have more than 700+ comments as well and i would like to use this opportunity to thank our frequent readers and blogger for commenting. Not bad huh? Well, lots of prominent blogger did mentioned that it is not easy and challenging for a blog to be able to maintain a blog for more than 3 months as lots of people give up blogging due to various personal reason during the first 3 month duration. I think Cupid Blogger Dot Com has no issues with that as we constantly update the blog with lots of interesting love and relationship content. With my two lovely author, Anya and Jamie who joined the writing team, Cupid Blogger Dot Com will not be able grow or maintain a substantial amount of traffic over the period. Anyway in my humble opinion, 100th post in 6th months is nothing to proud off comparing to other top blog which has more than 1000 post within 6 months period. But at least, Cupid Blogger break the 100th post mark rite? Next, it will be 10,000 milestone. Below, i will list out top 3 post based on page view and also number of comments in Cupid Blogger for the past 6months. 3. Long Distance Relationship: Love The Distance Or Distance The Love? 1. Long Distance Relationship: Love The Distance Or Distance The Love? 2. I Sold Cupid Blogger Dot Com For USD$10,000! Happy reading from Cupid Blogger and do feel free to comment on what we can improve and strive Cupid Blogger towards leading love and relationship blog authority over Internet. WOW! It’s a milestone! I’m so honoured to be part of this team and nothing is more fulfilling than writing for you readers from all over the world. Cheers, Cupid Blogger Dot Com!